In the beginning, keep this process relatively simple. It is not uncommon for the proper front wheel alignment settings for one track to be different than those for another track. But, as I said, for now get the alignment setting in the general ballpark, and then worry about fine tuning the alignment when you have a bit more experience. There are three terms you need to know when discussing alignments: camber, toe and caster. Camber is the angle of the wheel (measured in degrees) when viewed from the front of the vehicle. If the top of the wheel is leaning outward, away from the center of the car, then the camber is positive. If it is leaning inward, toward the center of the car, then the camber is negative. 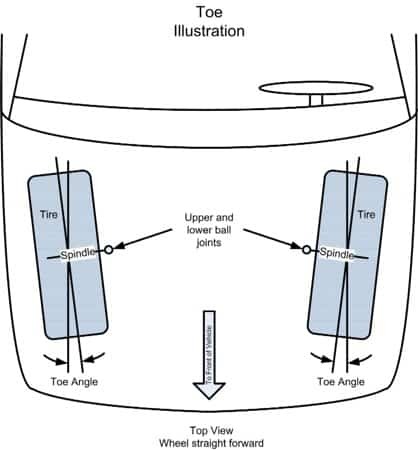 Toe is the difference in the “across” distances between the front of the tires and the back of the tires. 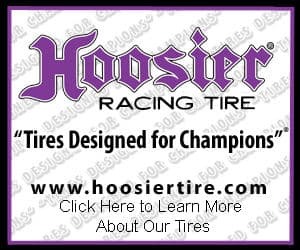 Toe-in means that the fronts of the tires are closer to each other than the rears of the tires. Toe-out is when the fronts are further from each other than the rears of the tires. The most important toe value is on the front wheels. Many vehicles don’t allow modification to the rear wheel toe. Understanding caster is not as straightforward as camber and toe. The axis that the wheel pivots on when steering is determined by the location of the upper and lower ball joints. One ball joint may be more forward than the other, resulting in the steering axis not being vertical. The caster angle is the angle the steering axis makes with the vertical. 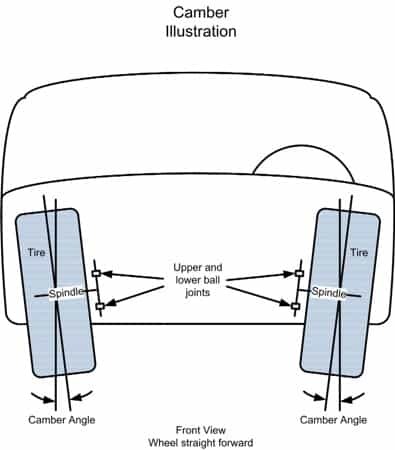 A positive angle occurs when the lower ball joint is more forward than the upper ball joint, as shown in the illustration. Conversely, a negative caster occurs when the lower ball joint is behind the upper ball joint. The second illustration shows the effect of caster on the wheel when the steering is turned. Positive caster, as illustrated, results in the wheel canting inwards at the top. This is similar to a motorcycle leaning into a turn. Note that front wheel drive cars typically don’t have provisions to adjust caster. In general, if you experience handling problems, other experienced drivers will typically be more than happy to offer some recommendations to improve the car’s handling performance. There are many items that can impact handling such as spring rates, sway bar, and strut settings, etc. Do be aware that these are just their recommendations, and while one person recommends that you go out and buy a set of higher rate springs, it does not mean that is the right thing to do.